Seattle is an ideal city for nature lovers to visit. In addition to having its own selection of choice parks and waterfront hangouts, it’s also within striking distance of a number of gorgeous outdoor destinations throughout the highly coveted Pacific Northwest. Here are our favorite Seattle Day Trips for Nature Lovers. A day trip to Bainbridge Island begins with a scenic, half-hour ferry ride across the gorgeous Puget Sound Basin, which offers gorgeous views of the water and city. Once at Bainbridge Island, you can explore nature in the 150-acre Bloedel Reserve, named one of the country’s top ten botanic gardens. The park is home to several Japanese-inspired gardens, a moss garden, and lush forests filled with a variety of trees that include conifer, pine, and Japanese maples. This location is also a great spot for wildlife sightings, the likes of which can include wild deer, ducks and other birds. Vashon Island is among the most feasible and enjoyable day trips from Seattle for nature lovers. Renting a car, you can enjoy an easy, one-hour drive from the hotel down to Vashon, with a scenic ferry ride included along the way. The island is located just southwest of the city of Seattle. At Vashon, there’s a lot for the nature lover to enjoy, including gorgeous beaches looking out over water surrounded by brilliant, snow-capped mountains. It’s also home to a number of quiet lagoons, which are magnificent spots to visit during the warmer months. We recommend enjoying the best of these sights at Dash Point State Park. Just over an hour drive away, Whidbey Island is another easy natural oasis to get to from Seattle. Located across the Puget Sound, the island offers much for nature lovers to enjoy upon arrival. Whidbey Island is a popular destination for local Washington State residents to go hiking, fishing, shopping, drinking, and eating. You can come here and spend some time on the beach, overlooking water backdropped by snowy mountains, or head into the woods and hike through trails. The historic Jamestown village is also well worth checking out. We recommend renting a car to go check out North Cascades National Park, one of the most breathtaking day-trips near Seattle. In the car, you can get there in just under two hours, so you’ll want to leave promptly in the morning to enjoy a full day. North Cascades National Park is home to a collection of turquoise-hued lakes, the most popular of which is the massive Ross Lake. Up in the surrounding hills, there are a number of trails that range in difficulty, many of which offer breathtaking views of the lakes, waterfalls, mountains, and over 300 glaciers. 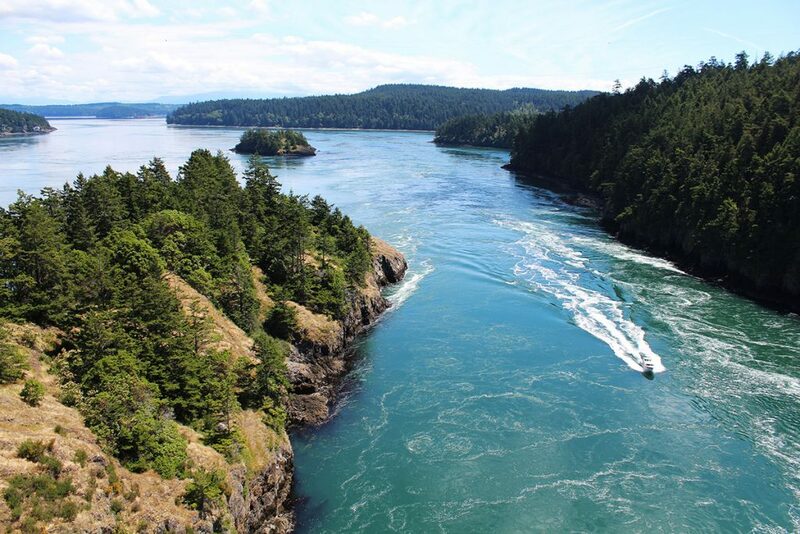 If you’re up for an even further trek, head up to the San Juan Islands for a taste of the Pacific Northwest’s most magnificent waterlife. The drive comes out to just over three hours, but the trek is worth it for those who enjoy the water and animal sightings. This trip also includes a ferry ride, which offers some scenery, and adds some flavor to the adventure. Whale watching trips are popular around the San Juan Islands, and when enjoying one, you can look forward to spotting some wild orcas, also known as killer whales. When traveling around San Juan Island, Lopez Island, Shaw Island, or Orcas Island, you can also indulge in hiking, wine tasting, and unique visits to lavender fields and alpaca farms.